The graduating class, Philadelphia College of Pharmacy, Philadelphia, PA, 1889. More than anything, a series of public health crises prompted nearly seventy physicians and chemists to establish a scientific institute committed to apothecary science and safe medicines. The setting was auspicious, Philadelphia's historic Carpenters' Hall, famed gathering spot of the First Continental Congress, and the challenge to public safety was every bit as real as the events of 1774. Like most urban centers in the early nineteenth-century trans-Atlantic world, Philadelphia routinely suffered through outbreaks of dysentery, yellow and scarlet fevers, cholera, and other communicable diseases. 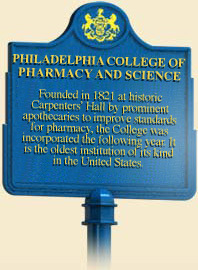 So in 1821, the College of Pharmacy and Science–now known as the University of the Sciences in Philadelphia–opened its doors. The new institute reflected the growing sophistication of Philadelphia's medical college professors, who had warned of the "ignorance of Apothecaries unqualified for the exercise of their profession." It also reflected a professional rivalry between the physicians and area druggists, which led to a separate College of Pharmacy. 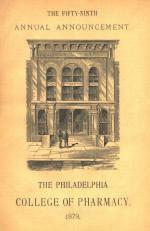 Philadelphia College of Pharmacy, Annual Announcement, 1879. Combining instruction in biology and chemistry with a progressive approach to treating illnesses, the College of Pharmacy advocated more rigorous standards and professional training for those licensed to dispense drugs, medicines, and other controlled substances. The ever-evolving, science-based curriculum reflected the growing professionalization of apothecary and medical science in the diagnoses and treatment of illness and disease. 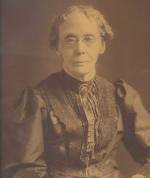 As another sign of its continuing maturity, in 1876 (the Centennial Year), the College of Pharmacy became coeducational. The College attracted some of the greatest scientific educators of the nineteenth century, and it graduated several pioneers of the American pharmaceutical industry. 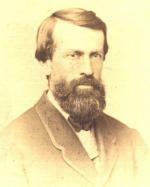 William Procter (1817-1874), the so-called "father of American pharmacy" who helped found the American Pharmaceutical Association, served on the faculty for three decades beginning in 1846. Professor and Dean John Maisch (1866-1893) was instrumental in establishing state and standards for the profession. Toward century's end Professor Joseph Remington (1847-1918) published several classic pharmacy textbooks that are still in use today. Graduates included such prestigious corporate names as Josiah and Eli Lilly, Gerald Rorer, William Warner, Robert McNeil, and John Wyeth. The College of Pharmacy underwent several name changes in the twentieth century as its undergraduate and graduate degree programs expanded to keep pace with changes in the field. Institutional research expertise expanded as well, with the faculty responsible for a large number of patents and discoveries vital to the medical and scientific revolution of the twentieth century. Over the years, faculty and alumni have contributed pioneering work in X-ray technology, and the development of medical ultrasound and a wide range of pharmaceutical products, drug screening tests, and other medical therapies. The College also operates the Marvin Samson Center for the History of Pharmacy, which displays homeopathic medicines, apothecary jars, and other items related to pharmaceutical history. Saul Sack, History of Higher Education in Pennsylvania (Harrisburg: Pennsylvania Historical and Museum Commission), 1963. Andrew M. Schocket, Founding Corporate Power in Early National Philadelphia (Dekalb: Northern Illinois University Press), 2007.